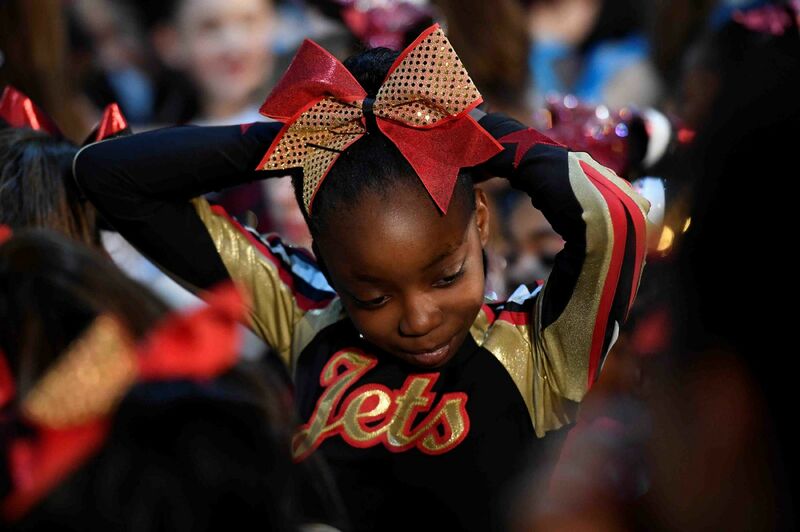 Established in 2008, the NM Jets Cheerleading Programme is based in Thornton Heath and currently features over 100 cheerleaders from the local area across four different squads. The programme is designed to support the growth and education of the athletes, promote teamwork and foster positive self esteem; a high value is placed upon commitment and hard work. An NM JETS performer at the Legacy Super Regional Cheer and Dance Championships, Copperbox Arena, February 2017 (photograph: REUTERS/Toby Melville). The programme is part-funded by BBC Children in Need but the group also raises funds independently. Bubblegum Schoolwear kindly provides the cheerleaders' kit while Tesco allows participants to bag pack. The programme is run by dedicated staff volunteers with help from top UK coaches. Older girls mentor the younger ones and several try their hand at coaching. The squads learn choreographed routines to competitive standards and have been successful in local, regional and national events for several years. In 2014, squads received first place trophies at the Future Cheer National Schools Competition and once again performed well at the Future Cheer International event, which showcases the UK's most outstanding squads. Over the years, the NM Jets have supported an ice hockey team, starred in a music video with MOBO winners, appeared on Radio 1 (following a visit by Jameela Jamil) and performed at a wedding. The college is extremely proud of the group's achievements and confident the girls will act as good role models for others in the local community. Visit the dedicated NM Jets website to find out more.